The modern ribosome is a large ribonucleic-protein complex that is the site of protein synthesis in all living cells. The bacterial ribosome consists of three rRNA molecules and approximately 50 ribosomal proteins. The precise and efficient assembly of these components is a highly coordinated process that is crucial for the cell growth. The study of ribosomal assembly dated back as early as the 1970’s, and recent progress in biophysical approaches allows it to be probed at higher structural and time resolution. Particularly, computational investigation of ribosomal assembly at atomic resolution has been made possible by the availability of sequences and structures of the intact ribosomes. In an in-depth phylogenetic analysis of the available ribosomes with Carl Woese, researchers in the Luthey-Schulten lab identified the sequence and structural signatures in both the 16S rRNA and 23S rRNA from 100 thousand environmental microbes. Sequence signature is a term originally coined by Carl Woese to describe the idiosyncrasies in the 16S rRNA that are characteristic of the three domains of life and used to construct the universal phylogenetic tree. 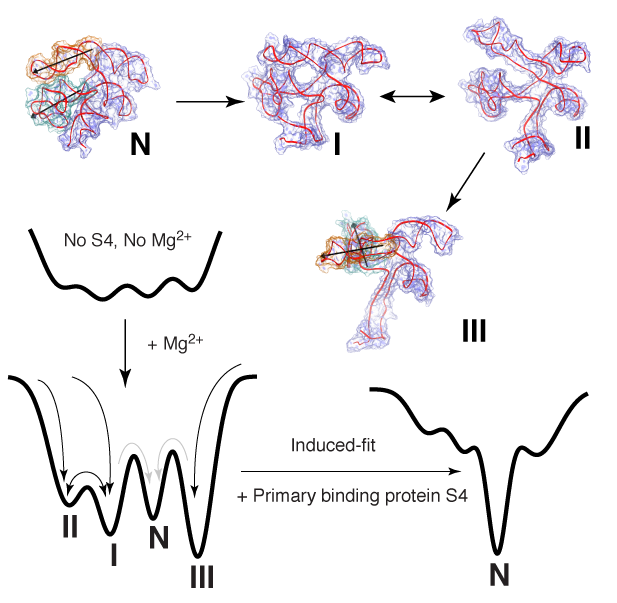 Using all-atom and hybrid MD-Go potentials, the Luthey-Schulten group investigated the functional role of the largest bacterial signature in the rRNA and its interactions with the primary binding protein S4 in nucleating the assembly of the SSU. The simulations provide molecular details that complement results from fluorescence spectroscopy, circular dichroism (Gruebele Lab, Biophysical Journal, 2010), and single-molecule FÖrster resonance energy transfer (Ha Lab, Journal Physical Chemistry, 2012), to reveal the folding pathways and to identify distinctive meta-stable intermediate states of the nucleating five-way junction in 16S rRNA. This study provides a comprehensive framework that combines in vitro and in silico methods to explore the complex energy landscapes of RNA and protein folding which are being applied to further studies of larger scale ribosomal SSU assembly.